For those who are unaware I would like to take a moment to talk about my latest business venture. I am offering my time and creative genius to create a personalized digital scrapbook for you. I’m sure you might have a couple of questions for me so I will attempt to read your mind and answer those questions below. Scrapbooking is the process of taking photos and putting them into a book along with memorabilia and journaling. Traditional scrapbooking usually requires lots and lots of time to do this because there are lots of embellishments, paper, photos, etc that have to be physically glued down to the pages. 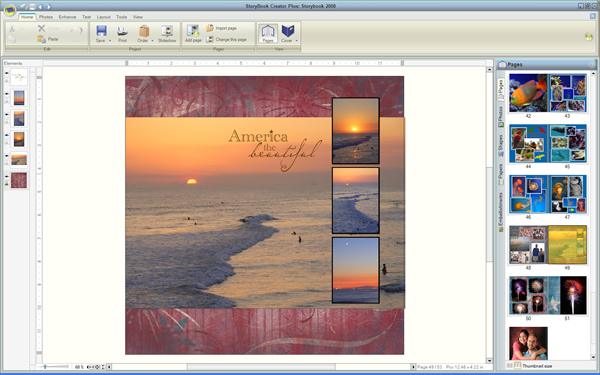 Digital scrapbooking streamlines this process by using digital photos and digital embellishments and putting them in scrapbooking software to create a photo book. Plus because there are no bulky papers, embellishments and photos to be glued onto the pages the book can be incredibly thin and easy to carry around. Why would I want a digital scrapbook? With the sheer volume of digital cameras being used these days we can assume everyone is taking a lot of pictures. But what is being done with all these photos? Are they being printed and framed? Put into a cheap photo album that was purchased at Walgreens? Are they still sitting on your computer, or even worse, are they still on your camera? Why even take photos? Think about having these photos displayed beautifully in a photo book on your coffee table so that when people visit you they can pick up your scrapbook and see these images and read the stories behind them. Why is scrapbooking so important? Three words: Preserving Your Memories. Let’s face it, we will one day forget what our lives were like today. Your kids may not remember the things you all did together as a family when they were very young. You may not remember the time you ran your first 5K or your parents’ 50th anniversary party. When you have a scrapbook with the photos of these special moments along with your own words retelling the stories behind each image you will always be able to look back and be reminded of all those memories. What are the prices of your books and what sizes are available? I have created this PDF that shows how I price my books and what sizes I offer. Click here to see it. Send me the photos you would like to have in your book. You can do this by mailing them or even delivering them to me if you live close by. If you would like journaling in your book, put together a Word document of your story and I will put it in your book for you. Once I have finished creating your book I will email you a PDF proof so you can approve the final book. Once you have approved your book I will ship it directly to your door step. If you are interested in getting a digital scrapbook and would like to see examples of my work and pricing information please visit my Digital Scrapbooking page. I want to take a moment to talk about a hobby of mine that I think goes hand in hand with my photography. I am talking about digital scrapbooking. 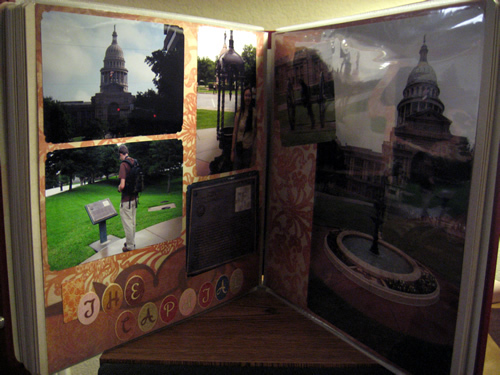 I was first introduced to scrapbooking a little over three years ago by Bryan’s former employer. She invited me to a scrapbook party, at the time I honestly didn’t know what scrapbooking was. She told me to bring over some photos that I wanted to make into an album. The albums that I was used to before were the regular cheap store bought albums with the plastic sleeves that you would slide your photos into and my personal favorite, those adhesive albums where the photos stuck to the pages. I found out later that those are a scrapbookers worst nightmare. I soon learned about terms like “acid-free” and “archival” and truly how important they are when preserving your memories. That’s what scrapbookers call album making, preserving ones memories. After completing my first album I was hooked, I had to make more. I invested more of my money into my habit…I mean hobby. I bought papers and embellishments and albums and many other scrapbooking must haves, it became quite an expensive habit…I mean hobby. I even became a consultant for Creative Memories, one of the leading scrapbooking companies, just so I could take advantage of the discount they offered their consultants. After that I was using their stuff exclusively, but I was growing tired of traditional scrapbooking. Traditional scrapbooking is actually a very time consuming process, it requires printing photos, buying papers, cutesy embellishments and gadgets that are designed to make your life easier. However, for someone like me who takes a lot of pictures, it was hard to find time to do this. Luckily with the popularity of digital cameras came a new way of scrapbooking. Many companies have started their own forms of digital scrapbooking and I’m sure most of them have a great product with excellent results. However, being a former Creative Memories consultant I’m going to talk about their digital scrapbooking software because that’s what I know. So I apologize in advance if this sounds like a promotion for Creative Memories, like I said I’m only going to talk about what I know. Digital scrapbooking to me is a very convenient way for me to preserve my memories. It really is a hassle to print out so many photos all the time. With digital scrapbooking you just use the photos you already have stored on your computer to be printed into an album. The software I use to do all my digital scrapbooking is CM’s Storybook Creator Plus. It was about $60 and came with a few digital papers. You can buy more digital papers from CM or you can search online for other companies that offer digital papers and embellishments and use them in the CM software. 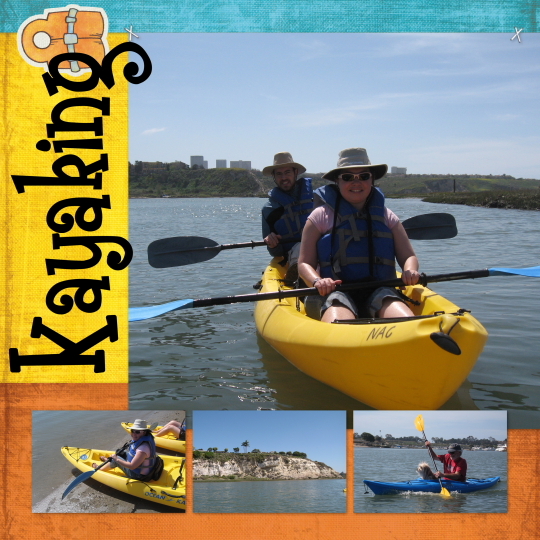 I have made over 20 digital scrapbooks, all of them with CM software and 4 specifically with Storybook Creator Plus. I usually make a scrapbook for the whole year, I just add events to the album as they happen. And yes I actually do plan things around scrapbooking them later, I visualize what my scrapbook pages are going to look like before I actually go to the event…scary huh? With digital scrapbooking I don’t have to do prints anymore, I simply design my pages, drop my photos in and it is done. I’m currently working on my 2008 album, I have provided some examples of the pages I created. I predict the album will be around 100 pages when completed. One fun thing about these particular albums is that you can design your own cover which I have shown an example of for my 2007 album. After your album is completed, you just upload it onto the CM website and it ships directly to you. A 100 page album like the one’s I make usually costs around $250 but the albums are a standard 20 pages so you can get one for much cheaper. I tend to go a little overboard. The print quality of the album is great but it’s not fantastic. I print a lot of my enlargements at Costco and when you compare the print quality there to the actual albums you can see the difference. This slightly lower quality printing in the album does not bother me at all, but for those who are perfectionists there is a way to still have fantastic prints of your designed pages. The Storybook Plus software allows you to save the pages as high res jpegs or tif files. You can always save these pages to a CD or flash drive and bring them to your local lab to print. I have a friend who saves two 12 x 12 pages on one page and prints them side by side at Costco on a 12 x 24 size print. But where do you put all these 12 x 12 pages? Ok now this is really going to sound like a CM commercial, but like I said it’s what I know. CM offers an album called the Picfolio Max, it’s a high quality 12 x 12 album with sleeved pages inside so you can just slide in your 12 x 12 prints. Amazing right? Storybook Page-I created this page with Storybook Creator Plus. This is a fairly simple page design and I used non-CM digital papers. 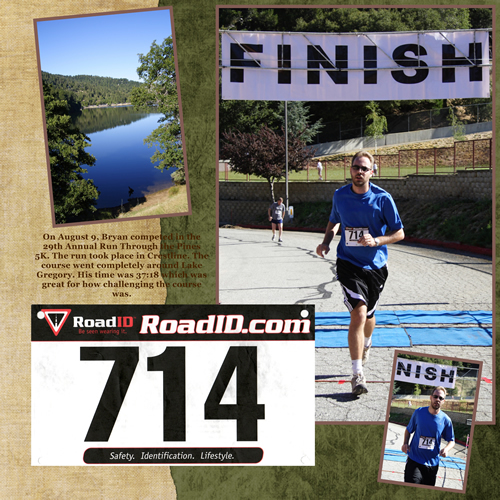 I also scanned Bryan's race bib so I could incorporate it into the page. A scanner is a digital scrapbookers best friend. So why is scrapbooking important? I know so many people who take lots of pictures of their family, friends, kids, etc but they do nothing with their photos. Why take personal photos if they are just going to sit on your computer? Some people choose to print all their photos into 4 x 6’s and pass them around at family gatherings. To those people, why do you do this? This drives me crazy, no one wants to flip through a bunch of prints while you hover over explaining what’s going on in each photo and reprimand them for getting their fingerprints all over your pictures. It’s all about the presentation, and not everyone has their degree in graphic design or is a computer whiz, so they can’t just whip up one of those fancy slide shows with music and effects. A scrapbook album, whether traditional or digital, is a great way to present your photos. You can even make them into little coffee table books, everybody looks at those things. My scrapbooks are important to me because they showcase a particular time in my life and I get to write in these albums all the random stories that accompany the photos. So one day when Bryan and I get older, and possibly develop a severe case of dementia, then at least I will have albums of my younger days and journal entries that help me remember. ATTENTION: I am now offering to scrapbook your memories for you. Visit my scrapbook page to see pricing, book sizes and examples of my work.